I hosted a few close friends for our annual luau a couple weeks ago. Oddly, no photos were taken, so I don’t have any to share with you guys. Instead, I’m going to share the mini sandwiches I prepared for the party. I started with this recipe, but changed it quite significantly. I thought there was just too much butter. Start by preheating the oven to 350 degrees. While the oven heats, start working on the sandwiches. Cut the Hawaiian rolls in half, creating a top and bottom. Leave the bottoms without their tops. Make the sauce by whisking all the ingredients together in a bowl. I gave approximate measurements above, as I wasn’t too careful with the measuring tools. The sauce shouldn’t be too thin or runny. Spread a bit of sauce on each roll bottom. Top with one folded piece of ham and half a piece of cheese (folded in half). Add a bit more sauce on the top of the bun, and place it on top of the sandwich. Spray a 9×13 pan with non-stick cooking spray and place the sliders into the pan. All should fit without stacking. Spray the tops of the buns just a bit, and cover the pan with foil. Bake for 15 minutes, remove the tin foil, and bake for about 5 minutes more. 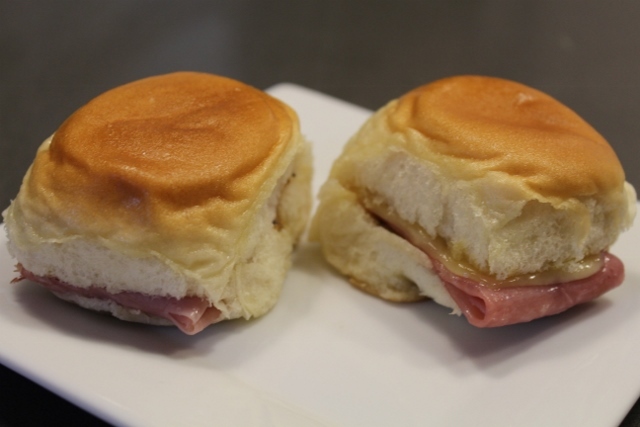 They came out delicious – much more so than I thought a simple ham and cheese sandwich would be. I think that sauce is definitely the key. I had some leftover, and put them in the fridge. Dan heated one up when he got home and said they were great even re-heated.